Washing-up liquid brand Fairy tapped into the International Women's Day conversation with a social post asking: "How fair is your home?" The film, posted on Facebook, asks why women spend 117 more minutes on average than men doing the housework, despite making up nearly half the UK's workforce. 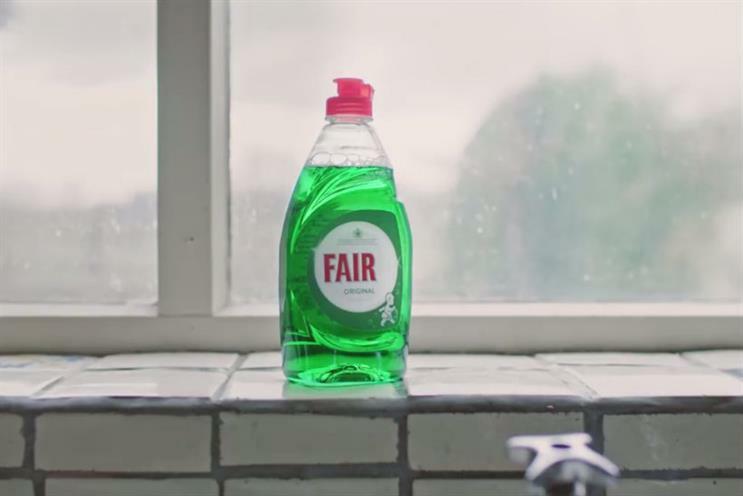 The P&G brand created a version of its washing-up liquid labelled 'Fair' rather than Fairy, handing it to several couples featured in the video to prompt more men into helping out. Men and women are more equal than ever before, but is housework shared fairly in your home? The campaign follows on from P&G India's 'Share the load' campaign for Ariel, which asks why mothers are in charge of the laundry. One ad, showing a father apologising to his daughter for setting a bad example and never doing any housework, went viral last week, after being praised by Facebook's COO, Sheryl Sandberg. Guinness 'Surfers' vs BrewDog's spoof: which ad won the neuroscience stakes? Will sports marketing get over the demise of lad culture?